Both wildlife biologists and hunters consider the resurgence of Mississippi’s wild turkey population one of the most dramatic conservation successes of the twentieth century. By the 1930s the state’s hunters had nearly extirpated the birds. Restocking, protection, and basic changes in the human way of life made for a spectacular return of the birds, which numbered perhaps four hundred thousand by the late 1980s. Wild turkeys were important sources of food and raw material for Native Americans. Successful hunters fletched their arrows with the wing and tail feathers and added the body feathers to garments and adornments. Native Americans also made tools from the leg bones and turkey calls from the wing bones, a craft that persists among some modern hunters. Some southeastern tribes associated turkeys with war. 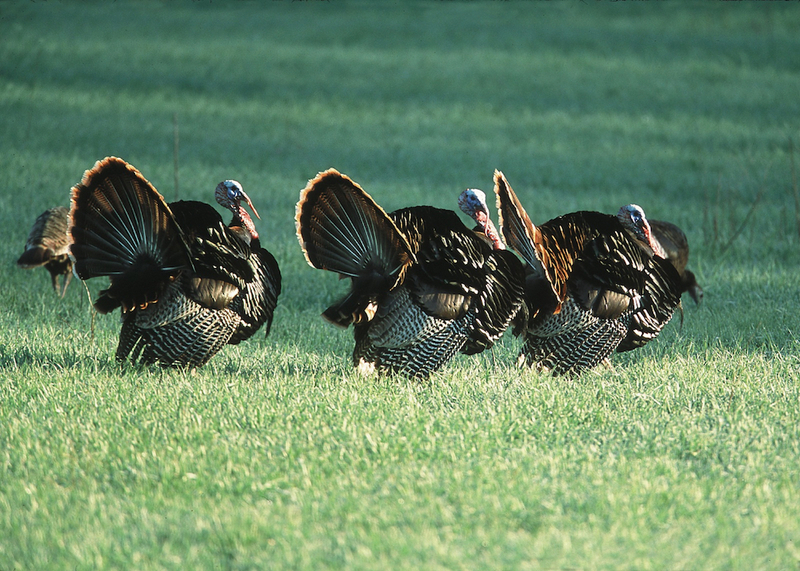 Male turkeys perform elaborate mating displays and fight each other for the right to breed. The featherless heads of the tom turkeys sometimes turn bloodred and may have connoted a scalped skull. Some native groups tried to convey the fury and lust of a wild turkey’s gobble in their battle cries. But no amount of raucous breeding could keep pace with the increasing pressures the growing rural population placed on turkeys toward the end of the nineteenth century. By the 1920s turkeys, like white-tailed deer, were found only in Mississippi’s most remote areas, such as the remaining uncut bottomland timber in the Delta and the Pascagoula drainage. Turkeys seemed to be creatures of the wilderness, and it appeared that they would eventually go extinct. Some hunters experimented with restocking efforts, mainly by releasing semiwild turkeys. Sporadic efforts, some under the auspices of the newly formed Mississippi Game and Fish Commission, continued into the 1930s. The use of pen-raised turkeys invariably failed, however, leading biologists to conclude that only wild-trapped birds could survive and reproduce. State wardens and biologists concentrated on capturing and relocating wild turkeys, most of which were caught in pole traps not dissimilar from the structures used by earlier market hunters. The process was slow, however, and not until the mid-1950s, when the cannon-projected net permitted the capture of an entire flock, did trapping and relocation become truly efficient. With better trapping methods and a steady supply of birds from protected public lands, biologists relocated groups of turkeys to as many suitable areas as possible. The small flocks needed protection from illegal hunting to become established, so many of the releases took place on the holdings of large landowners or among sympathetic communities where poaching could be controlled. At the same time, the rural population was declining, and large areas of the countryside reverted to forest. The constant pressure on turkey populations that had driven them to the point of extinction had eased, and the birds returned almost everywhere, even in areas once believed unsuitable for turkey range. More turkeys fueled an interest in sport hunting and the material culture it supported. The state’s long tradition of hunting male turkeys in the spring breeding season with calls of various types had almost disappeared along with the birds. As turkeys returned, call makers brought back old designs, improved some, and invented others to give hunters a chance for a gobbler. Calls constructed by various twentieth-century Mississippi artisans out of bone, horn, turtle shell, and cedar are among the most valuable and collectible of folk crafts. Turkeys and turkey hunting also helped foster big business in the state, helping to drive the game-call manufacturing of Wilbur Primo and the Mossy Oak camouflage clothing industry of Toxey Haas. While turkey numbers have declined from their 1980s peak, an era biologist George Hurst described as “our turkey bubble,” Mississippi still enjoys a robust population of approximately 240,000 wild turkeys. The spring season lasts more than a month, with a bag of one mature gobbler per day and three per season.